Sesamoiditis is a common ailment that affects the forefoot, typically in young people who engage in physical activity like running or dancing. Its most common symptom is pain in the ball-of-the-foot, especially on the medial or inner side. The term is a general description for any irritation of the sesamoid bones, which are tiny bones within the tendons that run to the big toe. Like the kneecap, the sesamoids function as a pulley, increasing the leverage of the tendons controlling the toe. Every time you push off against the toe the sesamoids are involved, and eventually they can become irritated, even fractured. Because the bones are actually within the tendons, sesamoiditis is really a kind of tendonitis - the tendons around the bones become inflamed as well. Sesamoiditis typically can be distinguished from other forefoot conditions by its gradual onset. 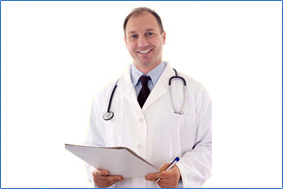 The pain usually begins as a mild ache and increases gradually as the aggravating activity is continued. It may build to an intense throbbing. In most cases there is little or no bruising or redness. One of the major causes of sesamoiditis is increased activity. You've probably stepped up your activity level lately, which has forced you to put more pressure on the balls of your feet. Speed work, hill work, or even increased mileage can cause this. If you have a bony foot, you simply may not have enough fat on your foot to protect your tender sesamoids. Also, if you have a high arched foot, you will naturally run on the balls-of-your-feet, adding even more pressure. Treatment for sesamoiditis is almost always non-invasive. Minor cases call for a strict period of rest, along with the use of a modified shoe or a shoe pad to reduce pressure on the affected area. 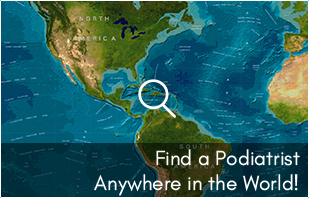 This may be accomplished by placing a metatarsal pad away from the joint so that it redistributes the pressure of weight bearing to other parts of the forefoot. 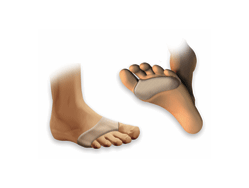 In addition, the big toe may be bound with tape or athletic strapping to immobilize the joint as much as possible and allow for healing to occur. It is recommended to decrease or stop activity for awhile. This will give your sesamoids time to heal. You should apply ice to the area for 10 to 15 minutes after exercise, or after any activity that aggravates the area. As with icing, anti-inflammatories will help the swelling go down so healing can begin. While the injury is healing, women should wear flat shoes on a daily basis. 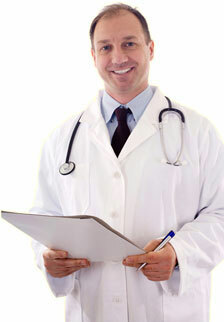 If home remedies do not work, see your doctor for a correct diagnosis. Review:It's what's inside this sleeve that counts! This elastic sleeve slips onto your forefoot to reduce pressure and provide extra cushioning protection. If you suffer from Sesamoiditis, painful calluses or general forefoot discomfort, this extra soft and breathable silicone pad offers you tremendous relief. "I work at a job where I walk all day; I'm always on my feet. Every night my feet are aching. 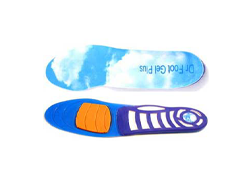 Since I put in these insoles, I haven't come home with aching feet once! I've used others before that were worthless, doing nothing but making my shoes tighter. But these are definitely worth any price! I'd recommend them (and have) to anyone."